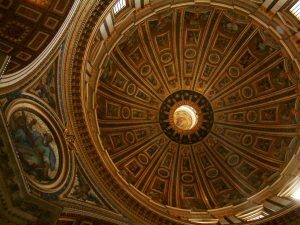 From the time of Julius Caesar, we have seen the rulers of Rome brag about building buildings that were bigger than any others in the world. You’ll remember Caesar referred to his Temple of Mars in that way, that he was building the largest Temple of Mars in the world. And we also saw the same for Domitian, with his palace on the Palatine Hill; for Trajan with his enormous forum; for Hadrian, building the greatest–largest dome that had been built up until that time and, as we discussed, still the largest diameter dome in the city of Rome today; and Hadrian’s Villa at Tivoli, just as a selection of examples. 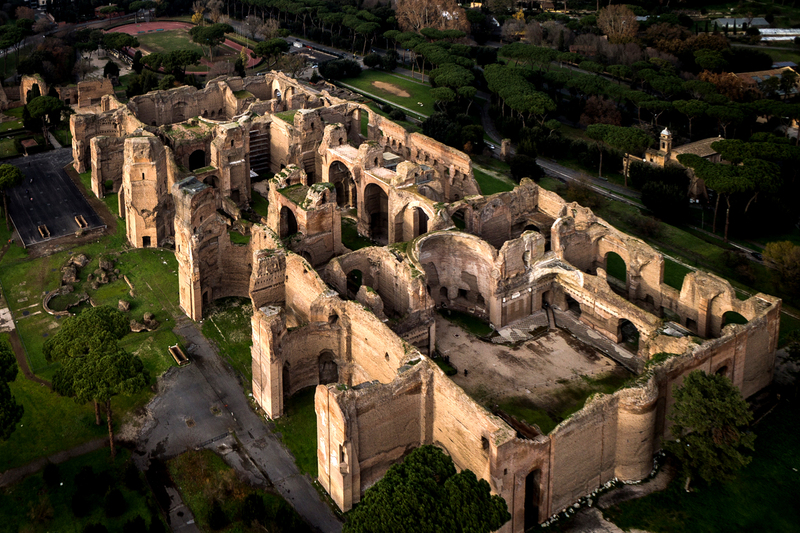 We are going to see today that if bigger was better, biggest is best, and in the case of the emperor Caracalla, an emperor who was a megalomaniac, in the tradition of Nero and Domitian, that he built the largest imperial bath structure to date. And we’re going to be looking at that bath structure today, and we’re going to see it as really a colossal and fascinating building, in all kinds of ways. 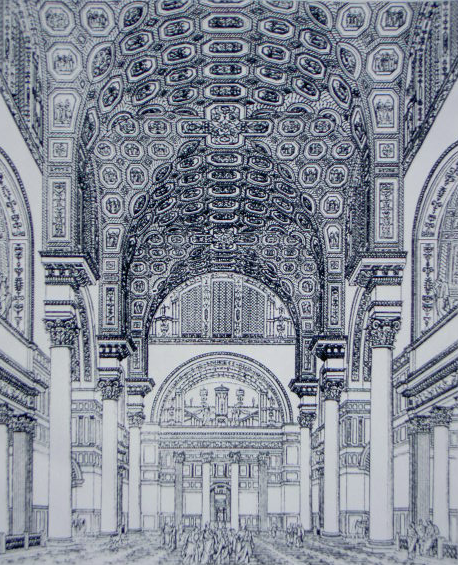 But before I get to that–in fact, we’ll end with that bath structure today–before I get to that, I would like to look with you at architecture in Rome, in the second and third centuries A.D., and we’ll see that architecture is quite varied in terms of whether it’s private, it’s civic, it’s also funerary. 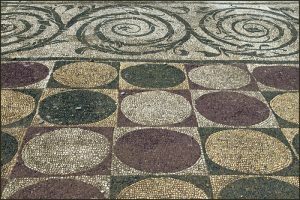 We looked at the city of Ostia, and we looked at the city of Ostia, the port of Rome, in its entirety; once again, its public buildings, its civic structures, its commercial enterprises. 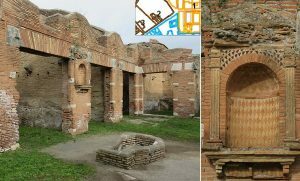 And we also went, at the very end of the lecture, out to Isola Sacra, where the tombs of those who lived in Ostia were located. And I show you a couple of those again above; these brick-faced tombs, these tombs that are made of concrete, at Isola Sacra, that were put up for the professionals, for the traders, the commercial merchants and so on that lived in the city of Ostia. They were made of brick-faced concrete construction. 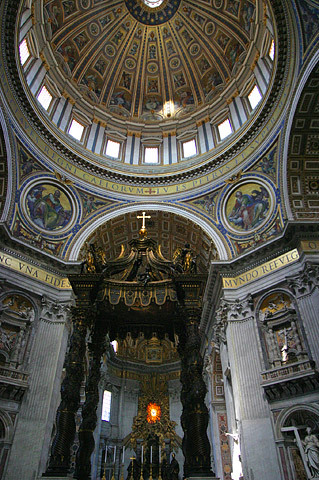 They had barrel vaults or groin vaults inside. 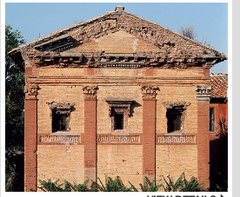 And you can see also that they were faced with brick that was exposed; the idea of brick being attractive in its own right, a fabulously beautiful facing, that they take advantage of in the second century A.D., and decide not to stucco it over, as you can see so well here. 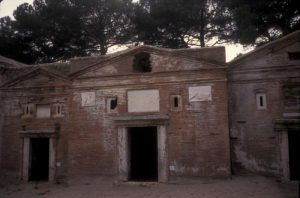 The doorways into those tombs, surrounded by travertine jambs and lintels, the inscription in the center, the small slit windows, and then a pediment at the top. 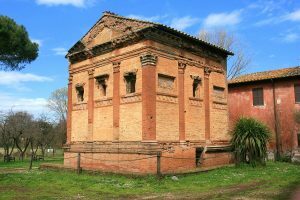 We saw, when we looked at funerary architecture in the age of Augustus, for example, that is was very varied; very varied. Tombs in the shape of pyramids, in the shape of circular tombs. 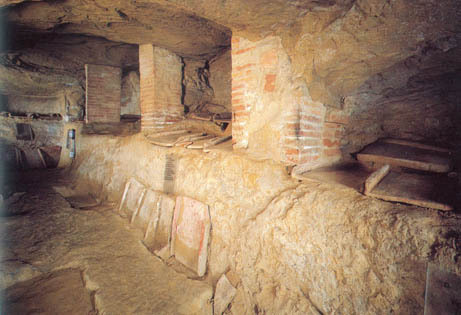 Tombs that made reference to bakeries, like the Tomb of the Baker Eurysaces. There is still a certain amount of variety in tomb architecture in the second century A.D., but they tend to hone in on one type in particular, and that type is the so-called house tomb type; which is exactly what we see here, a tomb that is rectangular in shape, for the most part, boxlike, and does resemble, very closely, a house; this close relationship that we’ve talked about so many times this semester between houses of the living and houses of the dead. So we looked at those last time. 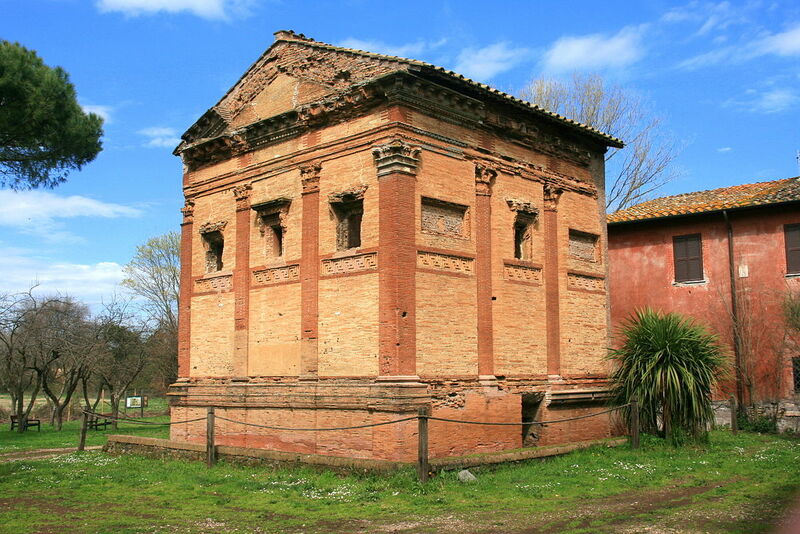 This is the Tomb of Annia Regilla on Rome’s Via Appia. It looks exactly like a typical Roman temple. We see that it is on a high podium; it has a deep porch. So if I were to show you this, and not identify it and say to you: “What kind of a building is this?” I’m sure you would have said it was a temple; and you would’ve been right in the sense that it looks most like a temple. But it is a tomb in the form of a temple, as you can well see here. I want to point out one detail that will loom large as we look further at this structure. You see that the tomb today is indeed well preserved. Concrete construction, faced with brick, the brick left exposed, respected and enjoyed, in its own right. What I’ve already described: the playing off of one color of brick against another; this meander pattern done in stucco; the stucco decoration, very elaborate decoration, as we’re going to see, around the windows; tall podium, we see that here as well. An extraordinary structure. Here are a couple of details. 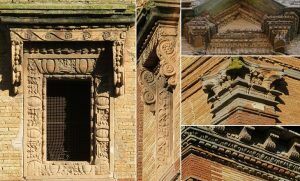 I show you once again a detail of the warehouse or the Horrea Epagathiana at Ostia that we looked at, and also a detail of the Tomb of Annia Regilla in Rome. And I think you can see here what I mean. 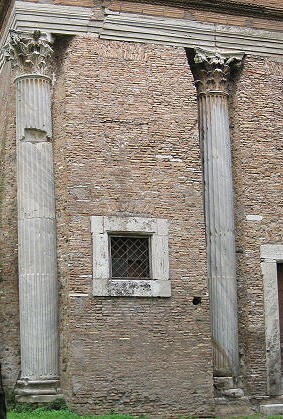 Again, the different coloration of brick, the yellowish brick, the reddish brick, played off one against the other; the use of stucco decoration, in this case for the volutes of the composite capitals. 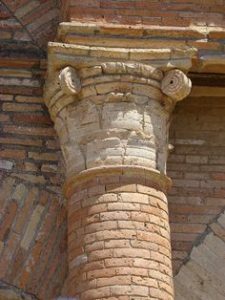 In this case–and in fact you’ll remember I pointed out what was interesting about these capitals at the warehouse was that they were–that the brick was used to make up the main body of the capital. And this is not one of them, but I also showed you one where you could see the way in which that brick formed the actual acanthus leaves of the capital, and then the volutes added in stucco. 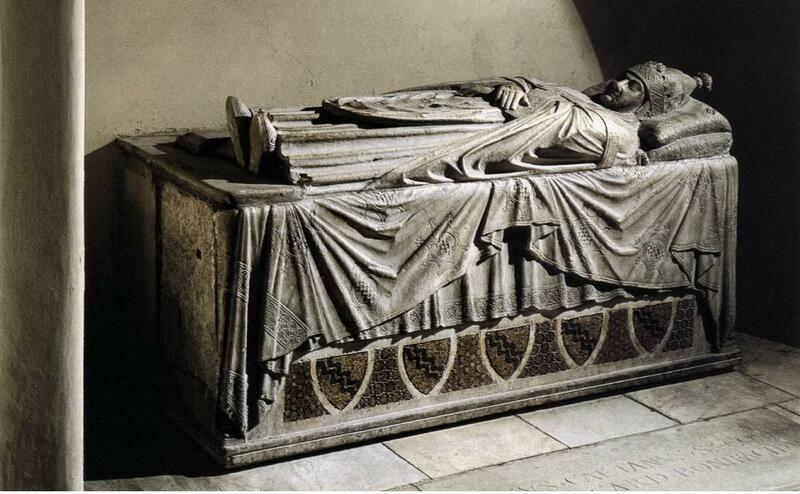 We see the same thing at the Tomb of Annia Regilla. 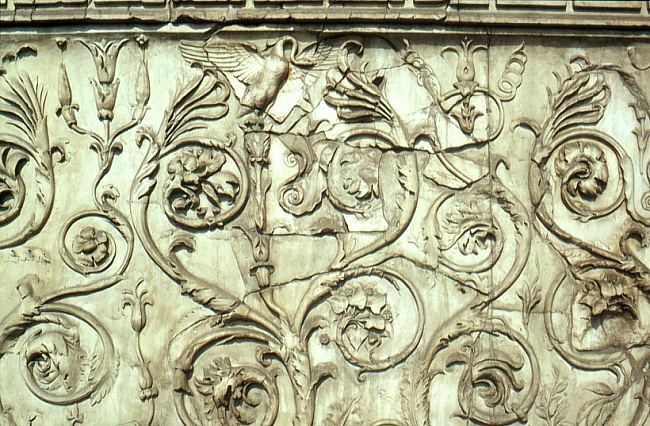 We see those–and here I think you can see it well — the brick used to create the lower part of the acanthus leaves, and then stucco added for the curving part, and for some of the additional decoration, the flower and so on up above. 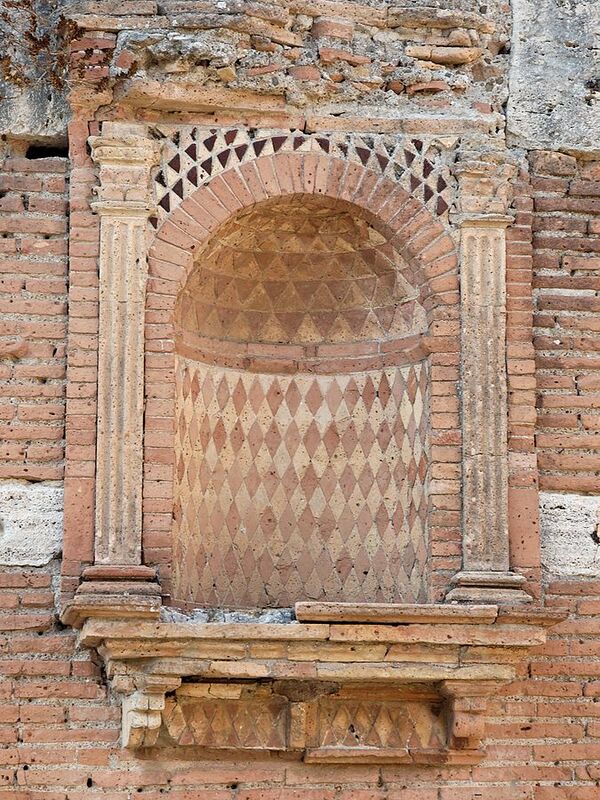 And so we see–and here again very elaborate decoration around the windows, which we also saw at the warehouse in Ostia. Here you see what I was talking about before, the way the architect has scooped out two areas on the left side of the tomb, and placed the columns inside of those, which is a unique–I don’t know of any other example of this in Roman architecture, and it underscores, once again, that when it came to tomb architecture, that the patron could pretty much do whatever he wanted, as long as the architect could build it. It could be quite idiosyncratic as a form of architecture. And we see not only has he scooped out these niches in which to place the columns, but if you look at those columns very carefully, and at the bases of those columns, you will see that they are not round. They are multi-sided, and the bases are also multi-sided. 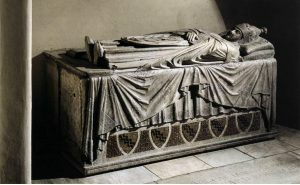 So doing something very unique in the context of this particular tomb of Annia Regilla. 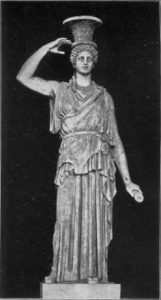 The Tomb of Annia Regilla had female figures with capitals on the top of their head, or what look maybe more like vases on the top of their head, but looking very much like caryatids, like the caryatids from the Erectheion in Athens, fifth century B.C., from the Forum of Augustus and from Hadrian’s Villa around the Serapeum. They are not duplicates of those in Athens, like the other two are, but they do seem to make reference to them. They’re a bit more casual. When I look at this pair, they always look to me like they’re kind of standing at a cocktail party together and conversing with one another, using the usual gestures that Italians are so famous for. We see them doing that sort of thing here. 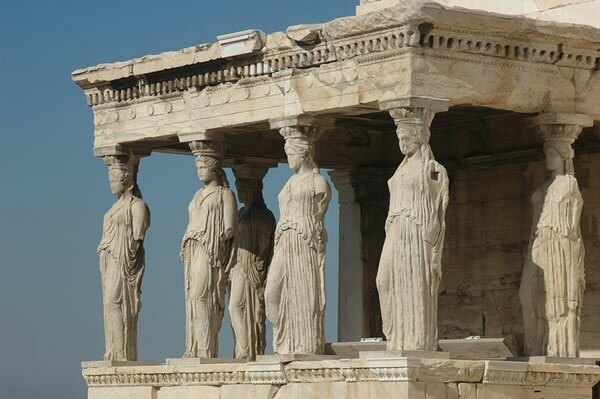 But they do seem to have that same pedigree, going back to the whole idea of the caryatids. 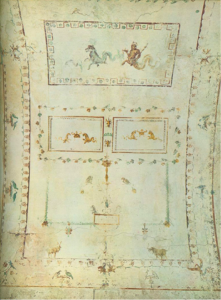 The Tomb of the Valerii, you see the lunette and the vault of the interior of that tomb right here. 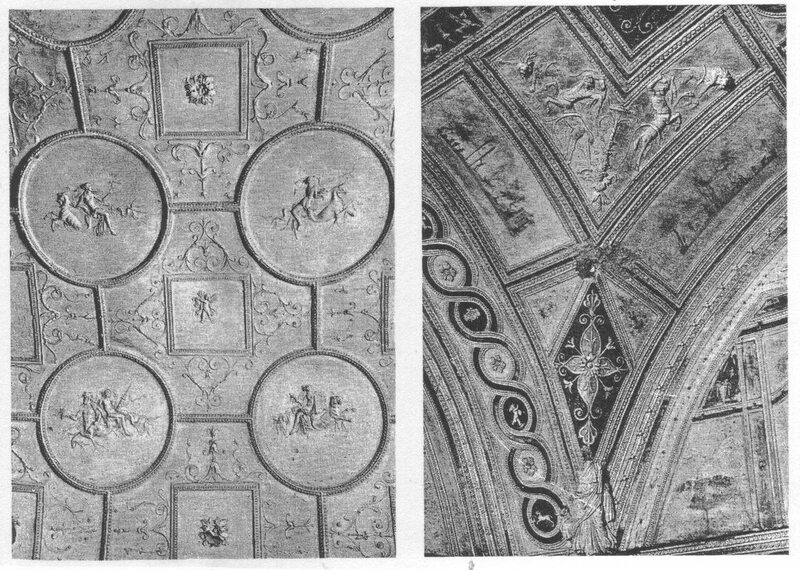 And as you look at the acanthus leaves growing up in the lunette, all done in stucco relief, and the barrel vault with its individual compartments, round and square compartments, with floating figures inside, you should certainly be reminded of things we’ve already seen before. 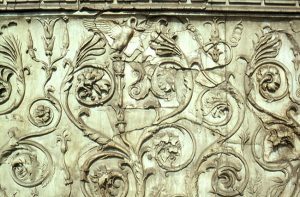 When one looks at the acanthus leaves, one can’t help but think back to the delicate leaves of the Ara Pacis, the delicate acanthus leaves of the Ara Pacis Augustae, which you see above. Scholars who have worked on this particular monument, in particular, have noted that they think it has to do with one of these secret mystery religions, in this case the Orphic religion that was practiced in secret initially and then eventually came up above ground. 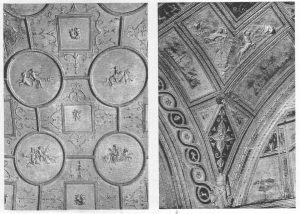 Two more details of the Pancratii ceilings, in stucco. These, I think, give you a particularly good sense of the way in which they were built up almost as reliefs, in some parts of these scenes. We see heraldic leopards on either side at the top of the arch. The shell in the niche also done in stucco and raised in a very sculptural way, and then the whole painted in a variety of attractive maroons and blues and greens (colors not well seen here). If you walk along though and look at these tombs, for the most part they look like typical Roman tombs from the second century: brick-faced concrete construction, with interesting decoration inside. 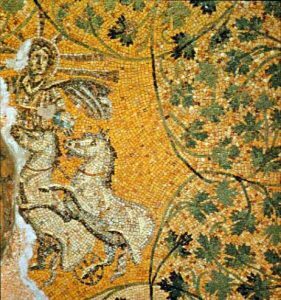 And I show you just the most famous mosaic that is located down there, which you see is a figure in a chariot. We think it’s a representation of the Sun God Sol or Helios, in the chariot, because you can see the rayed crown. 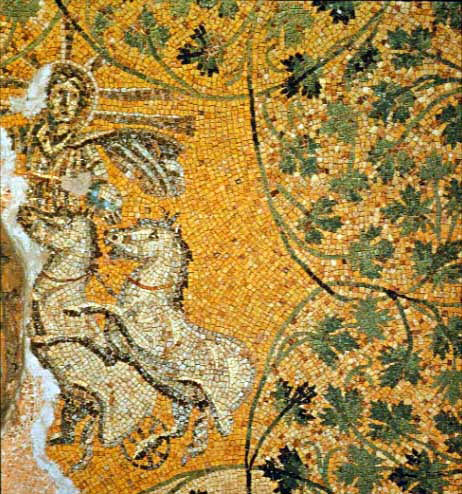 But some believe it is a representation of Christ as Helios. And I show it to you only because it is the single most famous mosaic down there, and one of the most famous mosaics in Rome, but also because it heralds what we’re going to begin to see happening, and that is this transition from paganism to Christianity in Rome–Constantine being the last pagan, first Christian emperor–and this interesting way in which pagan imagery elides into Christian imagery, both in terms of figural decoration, but also in terms of architecture. I can show you another set of tombs beneath a–that are very well lighted and can be photographed better–beneath a columbarium, an underground–a catacomb actually, an underground burial area that was used by the early Christians in Rome. It’s called the Church of San Sebastiano, and these tombs are underneath that. But I show them to you here, just to give you a sense of what that tombs looked like underneath the Vatican, with the concrete brick-faced tombs, looking very similar to those we saw at Isola Sacra. This is an axonometric view of the Tomb of the Caetennii. It dates to 160 A.D., in the Vatican Cemetery in Rome. 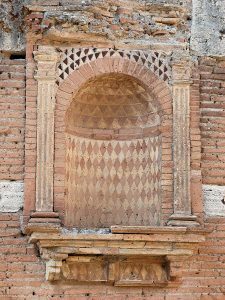 And I think you can see here both the brick-faced concrete construction, the way in which the windows have similar stucco decoration to what we saw on the Tomb of Annia Regilla, on the Via Appia in Rome. But most interesting for us is the way in which the interior is treated, because this is my type 2. Here we will see some stucco, but you will see here that the walls are enlivened in a different way. They are enlivened through architectonic means, through the use of columns, through the use of niches, through the use of pediments, triangular pediments, but also broken triangular pediments. Here you see a pediment that has been split apart, a triangular pediment split apart to show what is inside. 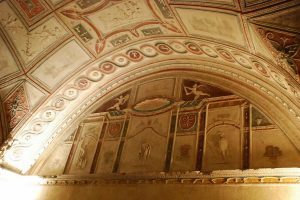 This is the same scheme that we saw in Second Style Roman wall painting, way back when; this whole idea of taking the traditional vocabulary of architecture and dealing with it in a very different way than had been done before — breaking the rules so to speak. We see that happening here. But the main thing is that we’re looking at this designer using architectural members to create the visual interest of the walls of the structure. 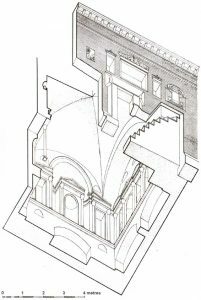 You can also see in this axonometric view this combination of small niches for cinerary urns, and then these larger arcosolia for the bodies. So cremation and inhumation still going on hand in hand, during the second century A.D. But if you look very carefully at the combination of sort of maroon and cherry red walls, you will see the remains of the architectural members that served to enliven this space. Look up here; you will see that there was a triangular pediment over the central niche. You can see parts of the broken triangular pediments on either side. 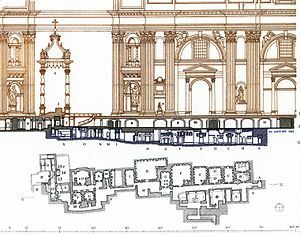 You can see the remains of capitals, and beneath those would have been the projecting columns that we saw in the axonometric view in Ward-Perkins. So this again the second type, where the walls are enlivened with architectural members, and those architectural members, when intact, would have created a scheme in which you had progression, recession, progression, recession, all along the wall — this in and out scheme that we’re going to see becomes the hallmark of what I’m going to term here this semester the baroque element in Roman antiquity, in Roman architecture. 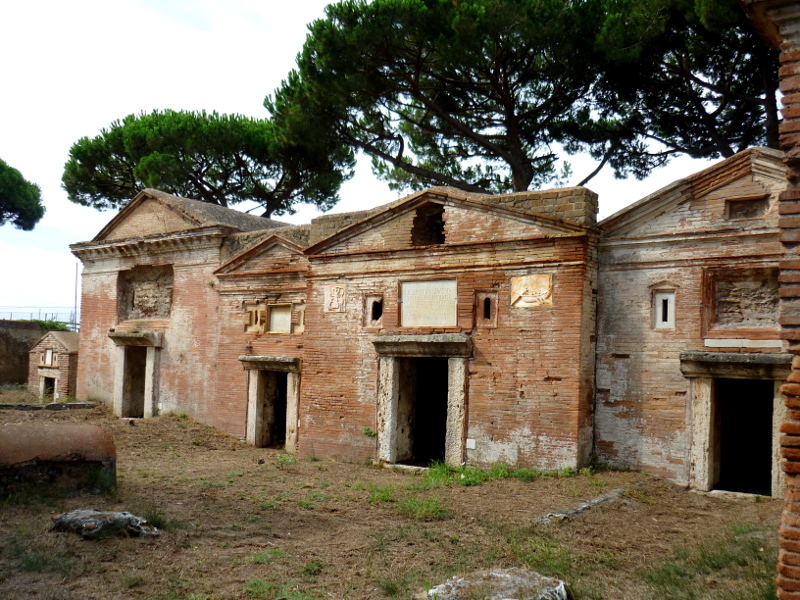 All of these buildings were being put up during the reign of Hadrian’s successor. 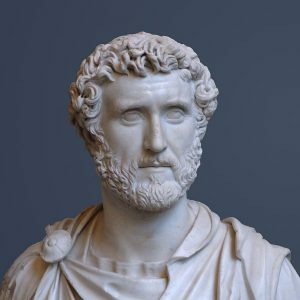 Hadrian had died in 138 A.D., and he was succeeded by a man by the name of Antoninus Pius. He reigned for a quite long time. He reigned between 138 and 161 A.D. It was a period of extraordinary peace. He, like Hadrian, was a peace loving man, and he was able to maintain that peace exceedingly well, and Rome really thrived under his emperorship. He’s also interesting because he seems to have had more of a love relationship with his wife than any other Roman emperor that I can think of, a relationship that was so strong that when his wife died–he became emperor–here’s his wife, Faustina the Elder. He became emperor in 138, but she died already in 141, and as I mentioned he stayed emperor until 161; so he was emperor for twenty more years after her death. He never forgot her. He stayed completely enamored of her. He never remarried. We don’t even have any rumors that he had any concubines or anything like that. He seems to have stayed completely true to her. 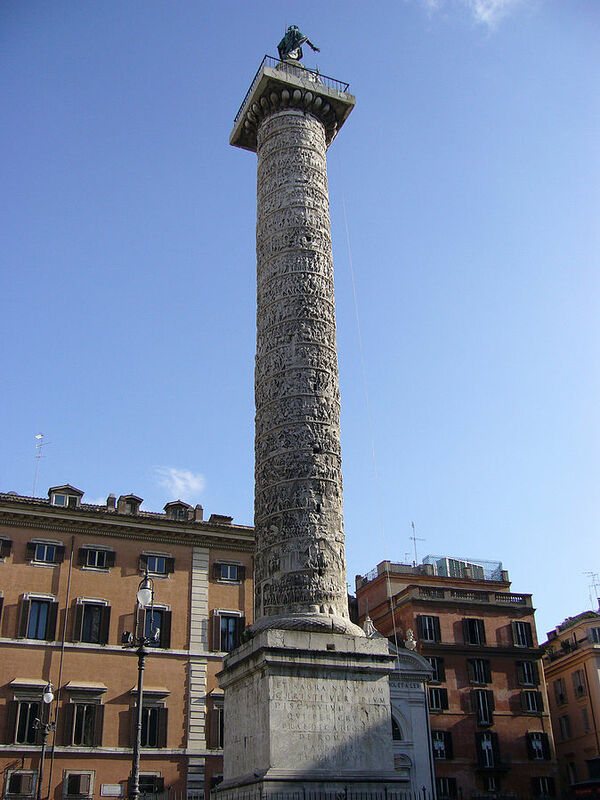 And what’s interesting is that when the two of them died, their successors, Marcus Aurelius and Lucius Verus, put up a monument to them. 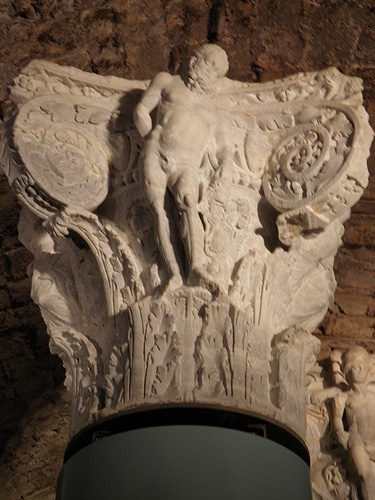 This base, which served as the base for a porphyry column, that was located on top, represents a scene in which we see Antoninus Pius and his wife, Faustina the Elder, being carried to heaven on the back of a male personification. 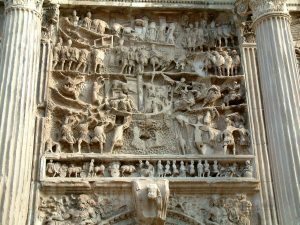 We see Roma, in the bottom right, and she is saluting them; she is bearing witness to what is a representation of their joint divinization. The two of them, Faustina the Elder, divinized at her death in 141; Antoninus Pius divinized at his death in 161. And yet we see them being carried to heaven as if their divinizations happened exactly at the same time. This is obviously a fiction. It is a conflation of time. It is a fiction of which the Romans were particularly adept in their sculptural representations. But I show it to you here because it has some bearing on a temple that I now want to talk about. 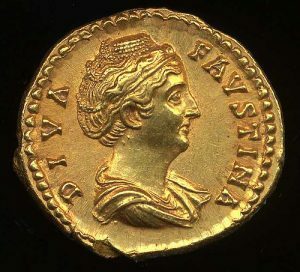 Above is a coin representing Faustina the Elder on the obverse of the coin, her portrait, and it refers to her as “Diva Faustina.” So it is a coin that Antoninus Pius struck after her death and after her divinization. 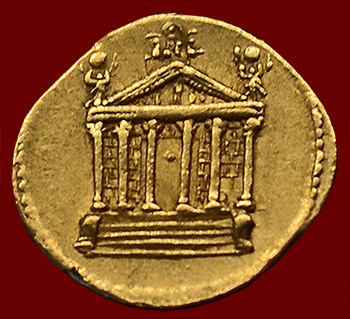 And we see on the back the temple that Antoninus Pius originally made, in her honor. We see a depiction of that original temple on the coin, and with a legend that says aeternitas, for eternity, because now she is a diva for eternity. Above is the temple and the Baroque building that was built into it, in the seventeenth century A.D., when it was turned into the Church of San Lorenzo in Miranda. 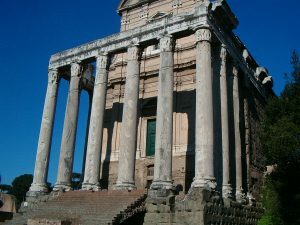 We see a typical Roman temple – the deep porch; the freestanding columns in the porch; the very tall podium; the single staircase; the façade emphasis–we see all of that here. 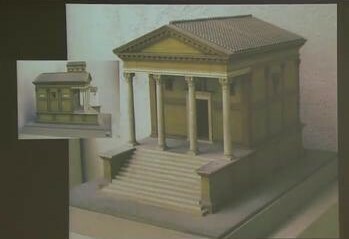 A very conventional Roman temple, with sculpture in the pediment and decoration on the eaves of the temple as well. 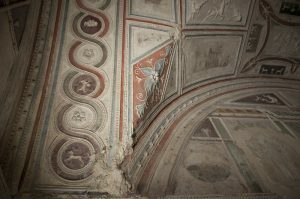 When the Basilica of San Lorenzo was added, part of it was preserved–maybe more of it was preserved, we’re not absolutely sure–but at least part of it was preserved. 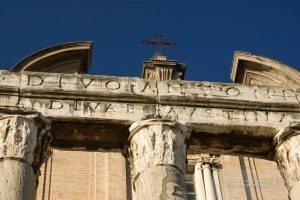 The walls, the sidewalls, and also the columns and the front of the–well the sidewalls primarily, and the columns, and the lintel over here that has the inscription that dedicates the temple to Antoninus Pius and Faustina. The ground level has risen, so that at the time that they decide to turn the Temple of Antoninus Pius and Faustina into San Lorenzo in Miranda, there’s no podium anymore. The podium is completely underground, as are part of the columns; we see only the part of the–so they put the door at the bottom, what is the bottom at that particular time. 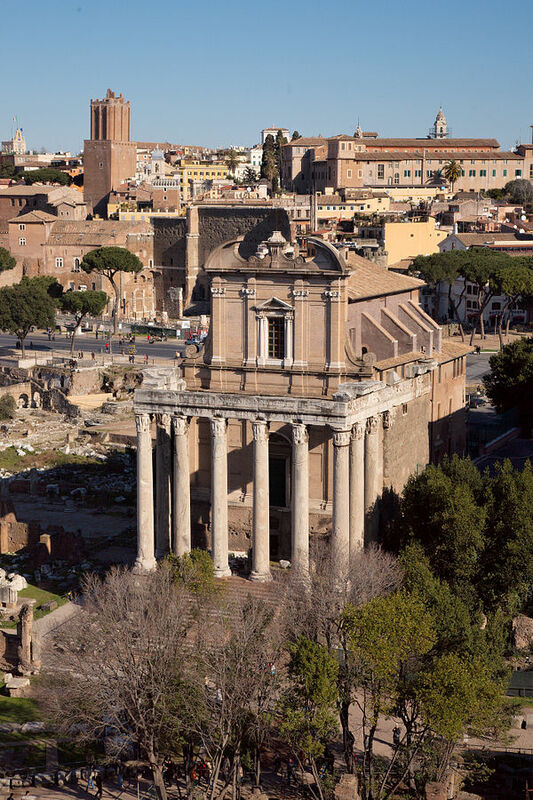 Its location is in the Roman Forum, with the backdrop of the Imperial Fora behind it: the Forum of Augustus, the Forum of Trajan. In the Roman Forum. So prime real estate for this temple, when Antoninus Pius decides to build it to his wife. 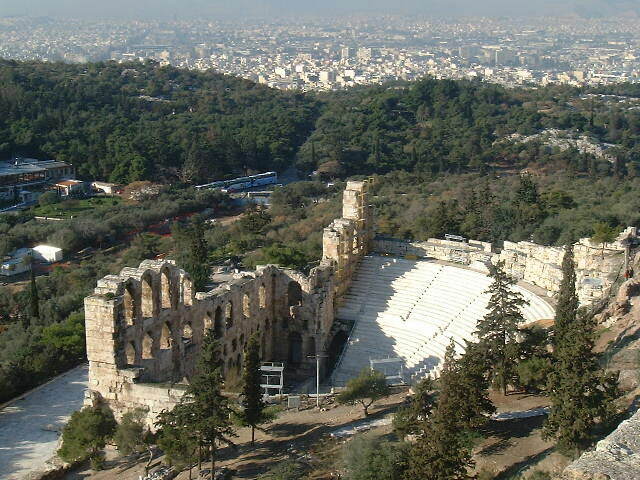 We see here the original podium, the original staircase, the original columns: grey granite columns, white marble capitals. 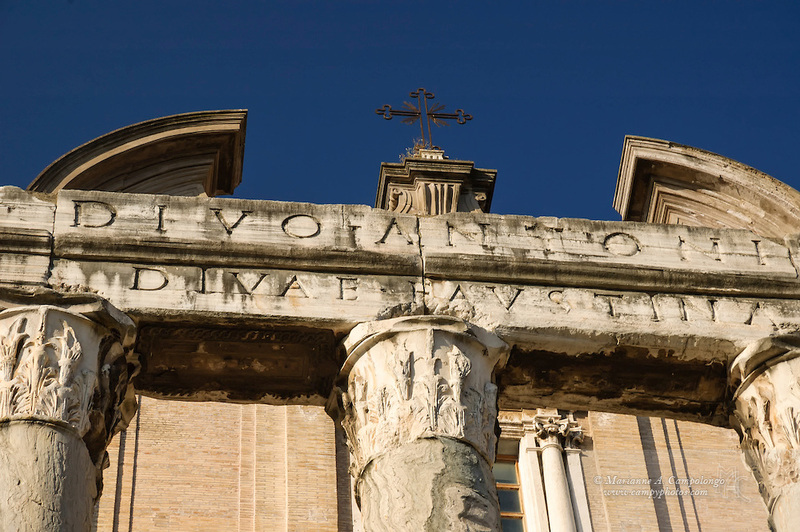 We see the original lintel with the inscription still preserved: To Divine Antoninus Pius, to Divine Faustina. We see the original tufa walls of the side. We see, growing up behind it, the seventeenth-century Baroque church, with its buttresses and with its broken arcuated pediment. And if you look very carefully, you will see this was ground level, in the seventeenth century. 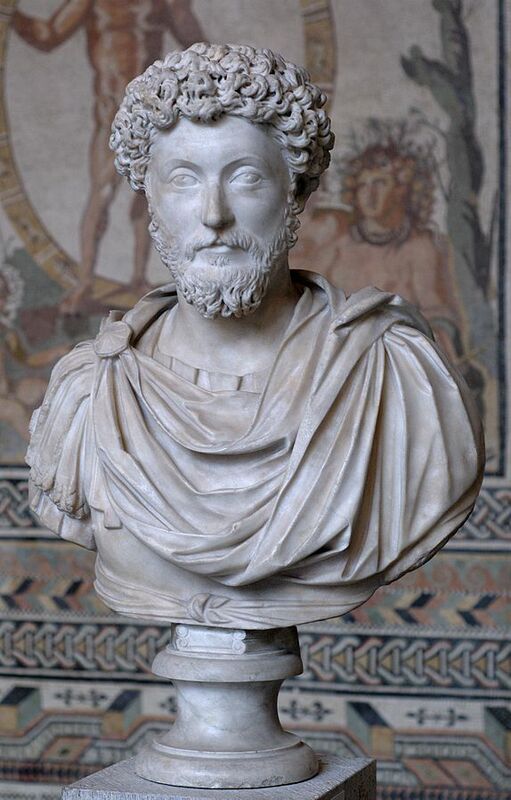 When Antoninus Pius died, in 161, he was succeeded by Marcus Aurelius and Lucius Verus; Marcus Aurelius, one of the most famous of the Roman emperors, the great stoic philosopher, and you see him above. You see Lucius Verus above. The two of them were co-emperors between 161 and 169. Lucius Verus died in battle in 169. Marcus Aurelius continued on alone, until the year 180 A.D. So he too had a very long reign. Marcus spent most of his reign, however, on the front. 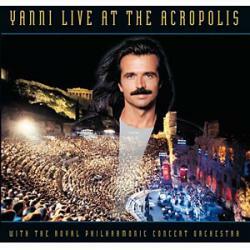 During the period that he was emperor, the barbarians were literally at the gates. There was concern that they were going to, in fact, overrun the city completely, overrun the Empire completely, and he had to spend most of his reign on the frontiers, and he did, beating back those barbarians. For that reason, there was very little architectural construction. 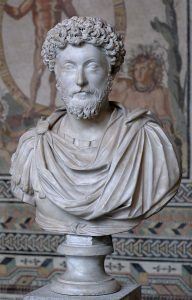 Even though he had a very long reign, there was very little architectural construction during the time of Marcus Aurelius, because of the time that he had to spend in war. He was succeeded by his son, Commodus, above. 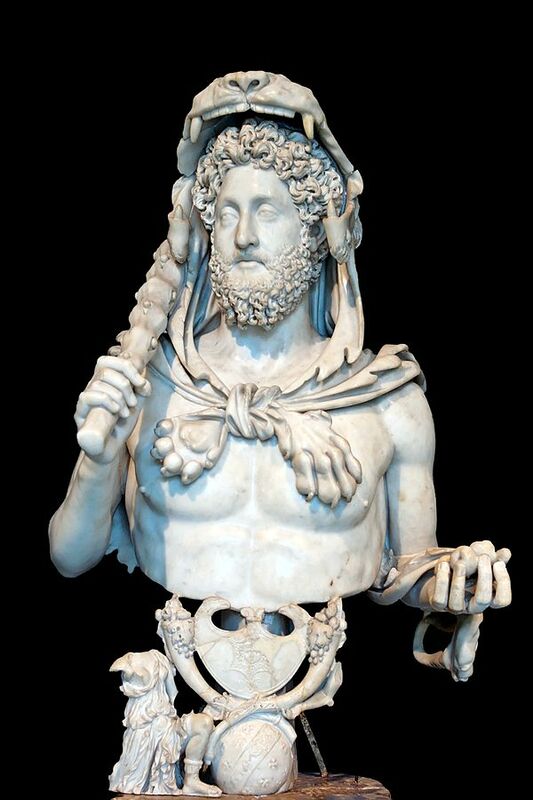 Commodus in the line, also in the megalomaniacal line of Nero and Domitian: a man who saw himself as a god on earth, who saw himself as the Greek hero Hercules. He called himself Hercules Romanus. 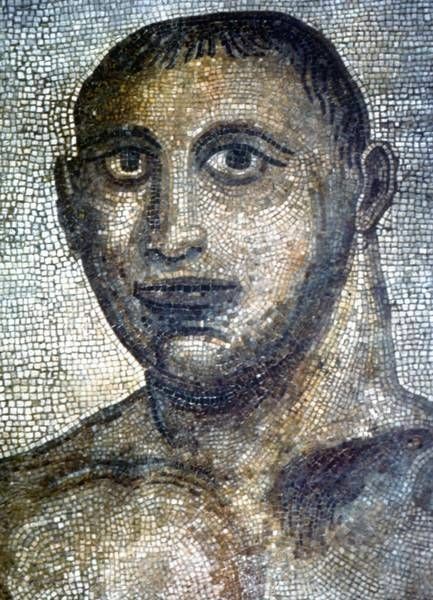 And we see him in his most famous and most fabulous–this is about one of the best portraits preserved from ancient Rome. 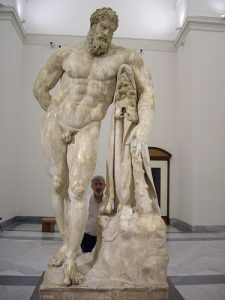 It’s in the Capitoline Museums today, and you see him masquerading here as Hercules, with the lion’s skin around his head, holding the club, holding the apples of the Hesperides, demonstrating that he has completed that last labor, just as Hercules had done, and is going to become a god in the manner of Hercules. 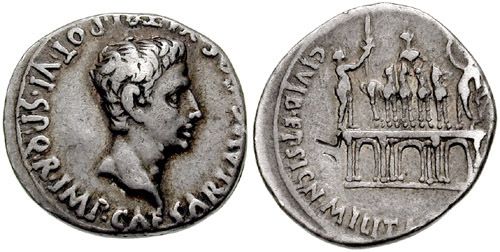 I now want to turn to a new dynasty that came to the fore after the end of the so-called Antonine emperors. 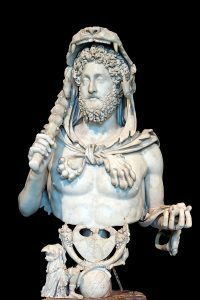 When Commodus died, there were no more Antonines to succeed him, and Rome once again fell into a civil war, and there were rivals warring with one another for supreme power. And the man who came to the fore was a man by the name of Pertinax. But he had other rivals, and one of them was the man who eventually really came out on top, and his name was Lucius Septimius Severus. 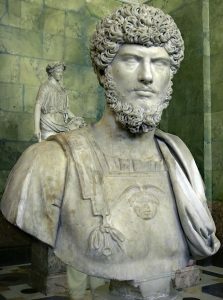 Lucius Septimius Severus was within that year, between 192 and 193, able to get rid of not only Pertinax but other rivals, and become supreme ruler of Rome. And because he, like Vespasian before him, had two sons to succeed him, Caracalla and Geta, he was able to set up a new dynasty, the so-called Severan, what we call the Severan Dynasty in Rome. The Severan dynasty in Rome, extremely important, because Septimius Severus commissioned some important structures, both public structures and private; he was an interesting emperor because he combined an interest in the two. 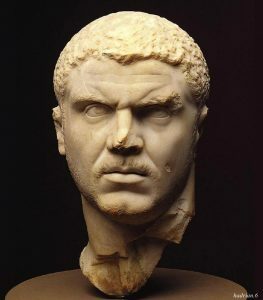 And then his son, Caracalla, who epitomizes, as I began today, the whole bigger is better, or biggest is best philosophy, in life and in architecture. I want to show you first, just to introduce you to these two patrons, this wonderful painted tondo that is preserved from Rome. 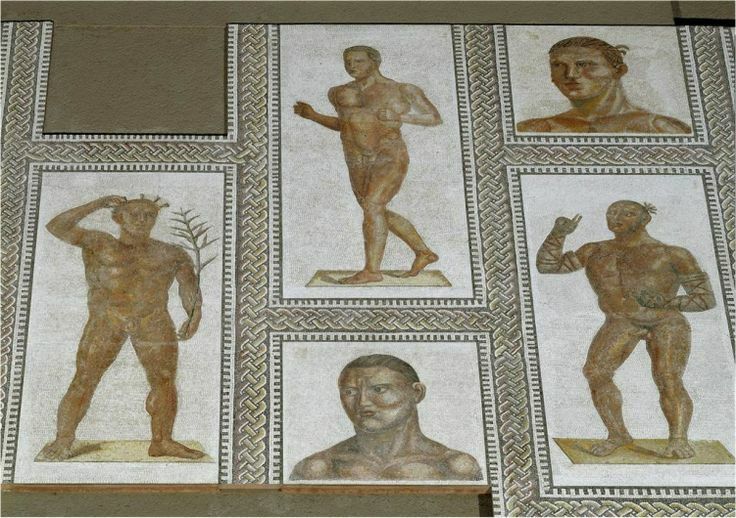 It was found–excuse me, not in Rome but in Egypt, and is now in a museum in Berlin. But it is important because it is our only surviving painting of an emperor, and not only an emperor but an emperor and his whole family, his wife and his children; the only surviving painting of an emperor today. But there were obviously many of these in antiquity. It’s a fascinating painting. We see Septimius Severus with his grey hair and beard, and his wonderful jeweled crown. 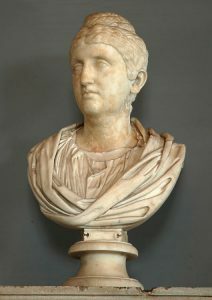 We see his wife, Julia Domna, who–and by the way, I neglected to mention, but one of the interesting things about Septimius Severus’ biography is the fact that he was born not in Rome, and not in Spain, as Trajan and Hadrian had been, but rather in North Africa, in a place called Leptis Magna, born in North Africa. I want to show you first though two buildings; before we look at the Baths of Caracalla, I do want to show you two buildings of Septimius Severus: a public building first, the so-called Arch of Septimius Severus in the Roman Forum, and then an extension to the Palatine Palace. 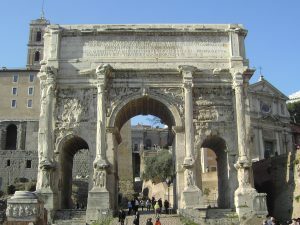 The Arch of Septimius Severus in the Roman Forum dates to A.D. 203, and it commemorates the Parthian victory of Septimius Severus. 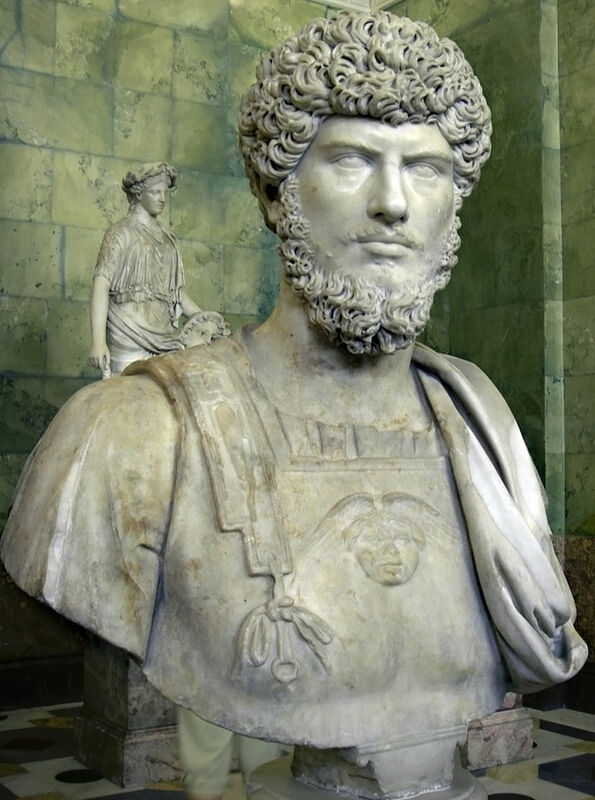 Septimius Severus, I already mentioned to you, came to power in a civil war. 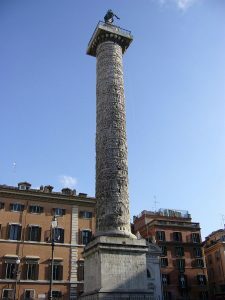 So like Augustus, and like Vespasian before him, he needed to gain legitimacy by having an important foreign victory, and he does this by looking East, as Augustus had done before him, looking to Parthia, and does war with Parthia, and in fact has an important victory, and celebrates that important victory in this triumphal arch that is put up in his honor in 203 A.D., in once again the choicest spot of real estate in Rome, the Forum Romanum (Roman Forum). 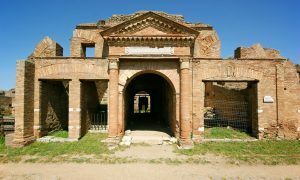 This was clearly very carefully orchestrated by Septimius Severus and his advisors to build his Parthian Arch in dialogue with the Parthian Arch of Augustus. 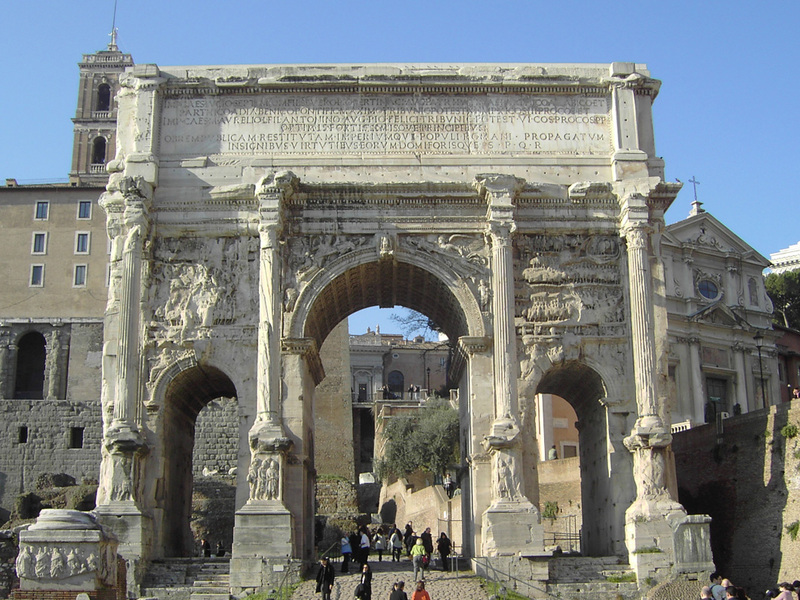 With regard to its form, it also made reference to the Augustan arch. I show you here the Arch of Septimius Severus as it looks today. 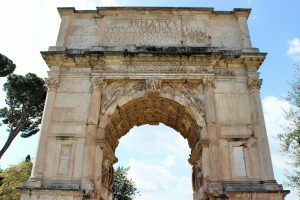 It is our first example that we’ve seen this semester of a Roman arch with a triple arcuated opening: a large arcuated opening in the center, flanked by two smaller, lower arcuated entrances. 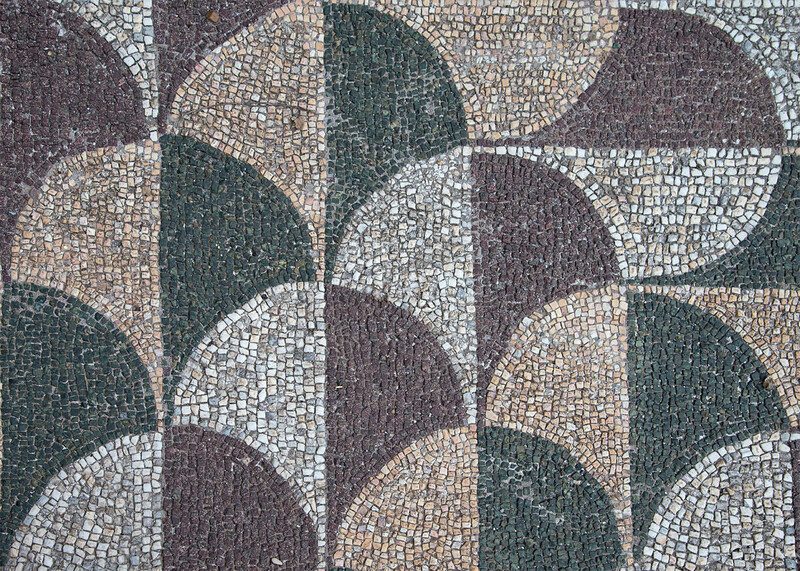 We have not seen that before — first surviving example in Rome. We remember, if we think back to the arches we have explored, from the time of Augustus on, you’ll remember that they are single-bayed arches. 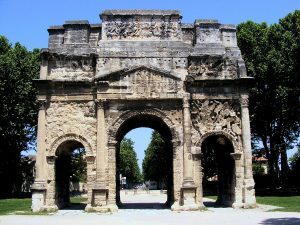 Augustus’ Actian arch, the Arch of Titus, and even the second-century Arch of Trajan at Benevento. Or maybe it wasn’t so new, because there’s an arch–the arch that you see down here–in the south of France, at Orange — and we’ll look at this arch when we make our journey to the south of France; in an upcoming lecture we will look at this arch. 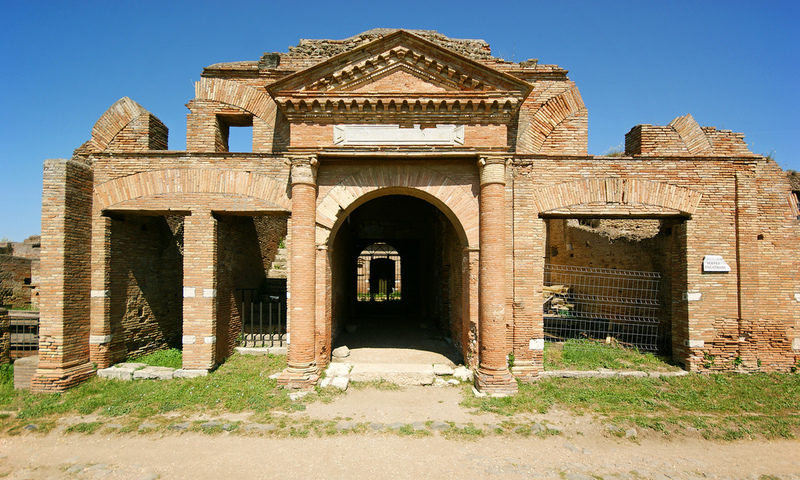 And it’s a triple-bayed arch, just like the Arch of Septimius Severus. It’s covered with sculpture, just like the Arch of Septimius Severus. So for a while there were scholars who dated this to the time of Septimius Severus, although put up in the provinces. But recent scholarship, more recent scholarship, has demonstrated–scholars have looked at the piles of arms and armor on here, and identified it as piles of arms and armor that had to do with battles that took place in the south of France, or what is now the south of France, in the age of Augustus. 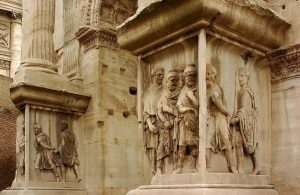 There’s also an inscription referring to a specific historical figure who lived during the time, the late period of Augustus, and into the time of Tiberius. 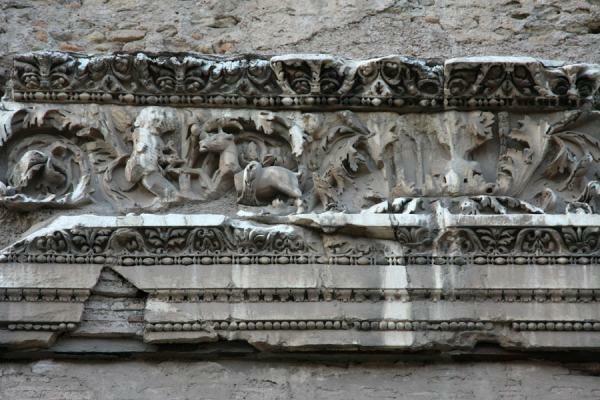 Above are more views of the Arch of Septimius Severus. It’s mainly a work of sculpture. But just to show you the three bays. Victories in the spandles; river gods down here; inscription at the top. You’ll have to imagine the great bronze quadriga of the emperor at the apex. Decorated bases down here. 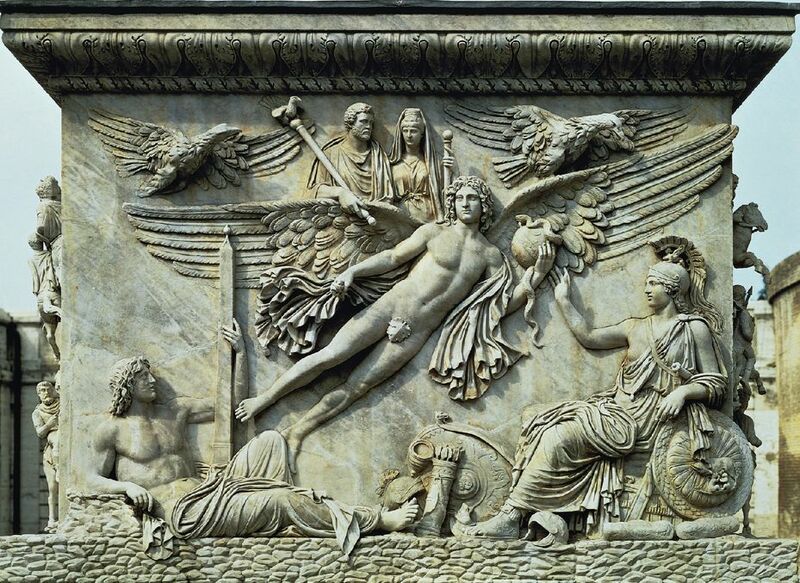 But most interesting are the panels that we see, four panels that we see, two on either side of the arch. And I show you a detail, a very good detail, of one of them here; although it’s weathered, you can see it quite well. 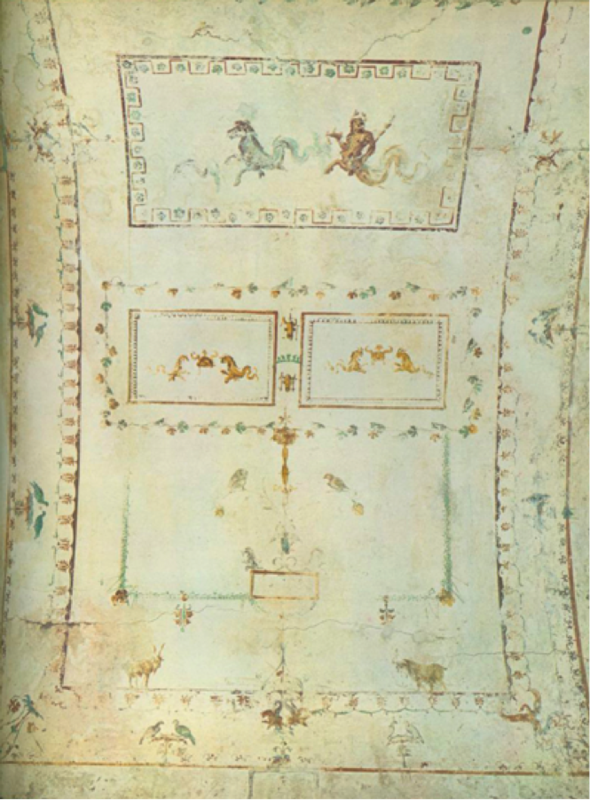 You can see that this panel, instead of having full-length figures standing on a single ground line, as we saw, for example, in the frieze of the Ara Pacis, we see figures on a number of tiers here, small figures on a number of tiers. 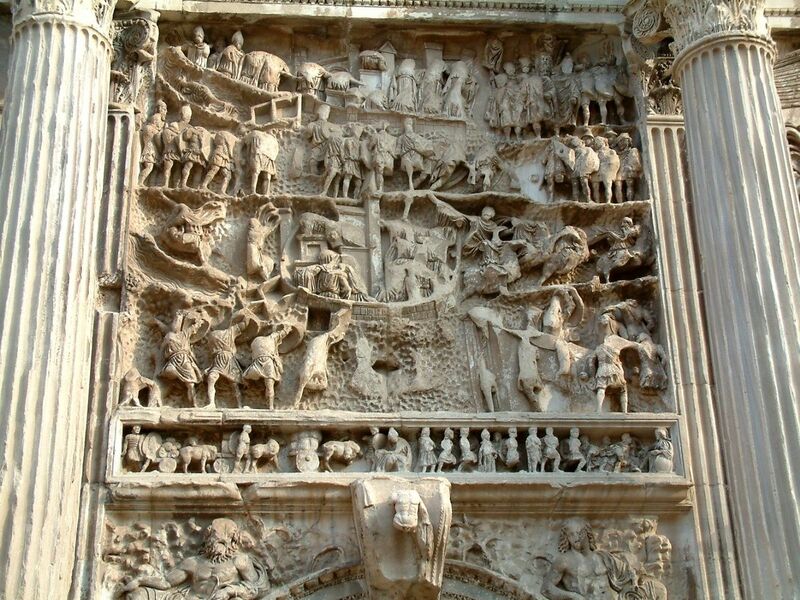 It should remind you of the scenes on the Column of Trajan, those spiral, the spiral frieze, with the individual figures telling the story of war, and in this case the Parthian War of Septimius Severus. 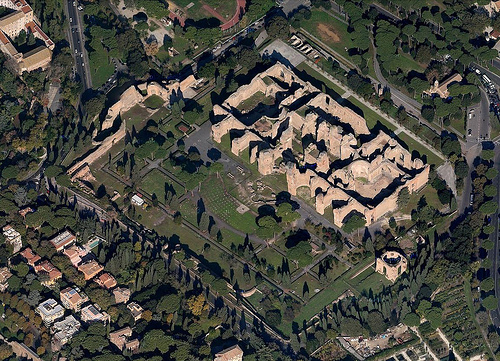 I want to speak very briefly also about Septimius Severus’ extension of the Imperial Palace on the Palatine Hill. He extended it to the south. He lived there, just like every emperor since Domitian. 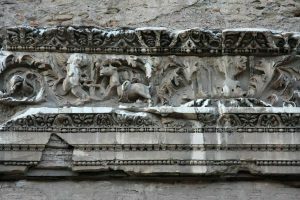 He extended it on the southern side–that’s the side nearest the forum–and he added a façade to it, a very elaborate façade that does not survive. 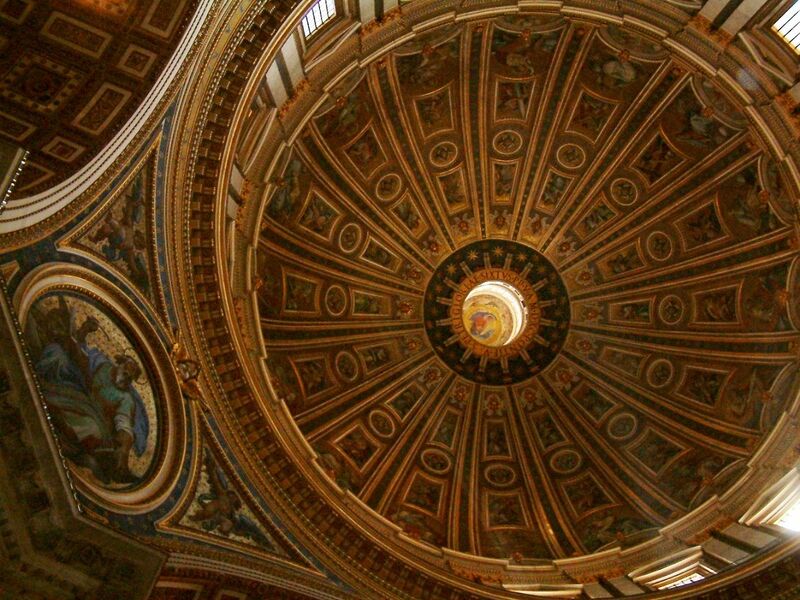 It doesn’t survive because we know it was torn down in 1588 to 1589 by one of the popes, because the pope wanted to use it in his own papal building; wanted to use the building materials in his own papal building. 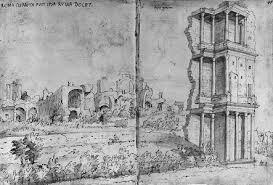 But fortunately the artist, Marten van Heemskerck, the Renaissance artist. He drew some of it while it was being dismantled. The reason it’s referred to as the Septizodium is because it was thought to commemorate the seven planets, which is not surprising in the orbits of Septimius Severus and Julia Domna, because we know that Julia Domna was an avid follower of astrological signs, used to predict what was going to happen in her husband’s reign, through those signs, and this is likely a nod to her particular astrological interests. 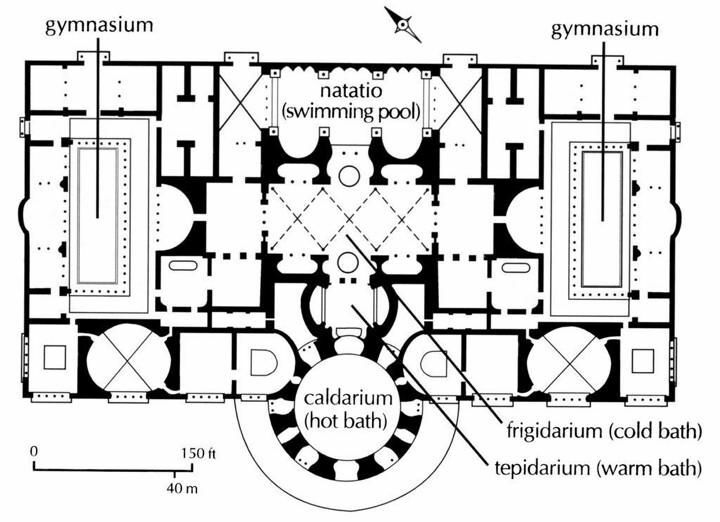 I want to end with this extraordinary imperial bath structure that was designed at the behest of the emperor Caracalla. 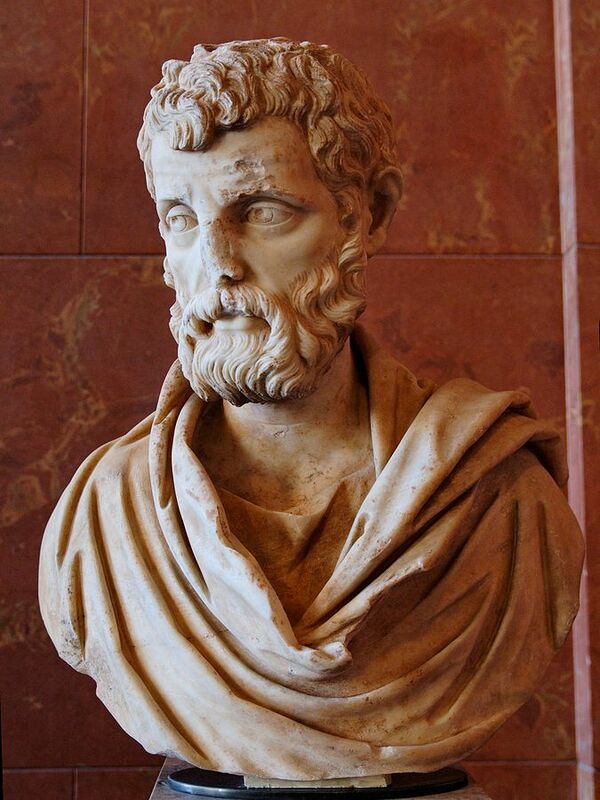 When Septimius Severus died in 211, he was succeeded by Caracalla and by Geta. 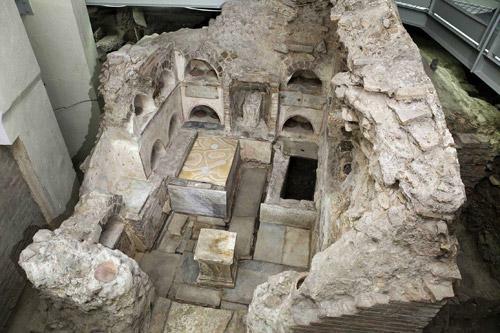 I’ve already told you what Caracalla did to get rid of Geta, and Caracalla became sole emperor in 212 A.D., and remained emperor until his death in 217 A.D. And one of his major commissions was this imperial bath structure. He wanted to ape his father, because we know that Septimius Severus had also built a major public bath in Rome, the Thermae Septimianae. They do not survive. We have very little knowledge of them, so there isn’t anything that I can show you or tell you about them. But we know he built it. So like father like son. He wanted to outdo his father–this is like Bush One, Bush Two–wanted to outdo his father, and to build an even larger bathing establishment. 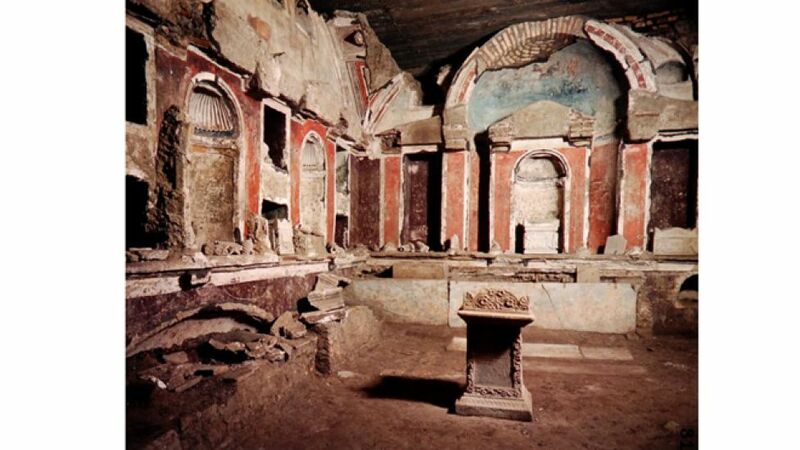 And he does it here, in Rome, a bathing establishment called the Baths of Caracalla, or the Thermae Antoninianae. 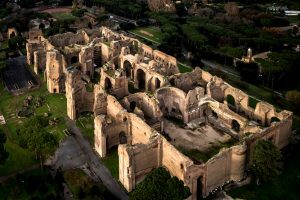 Baths of Caracalla: dates to 212 to 216 A.D. Any of you who have seen it will agree with me this is one–if we had, if Trajan’s Forum was the mother of all forums, this is certainly the mother of all imperial bath structures. This is quite something. Fortunately, much of it survives, mainly the concrete shell, a concrete shell of itself. 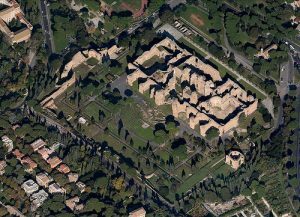 But we can see the outlines in the above aerial view, which shows you not only the bathing block, but also part of the precinct that surrounded it. 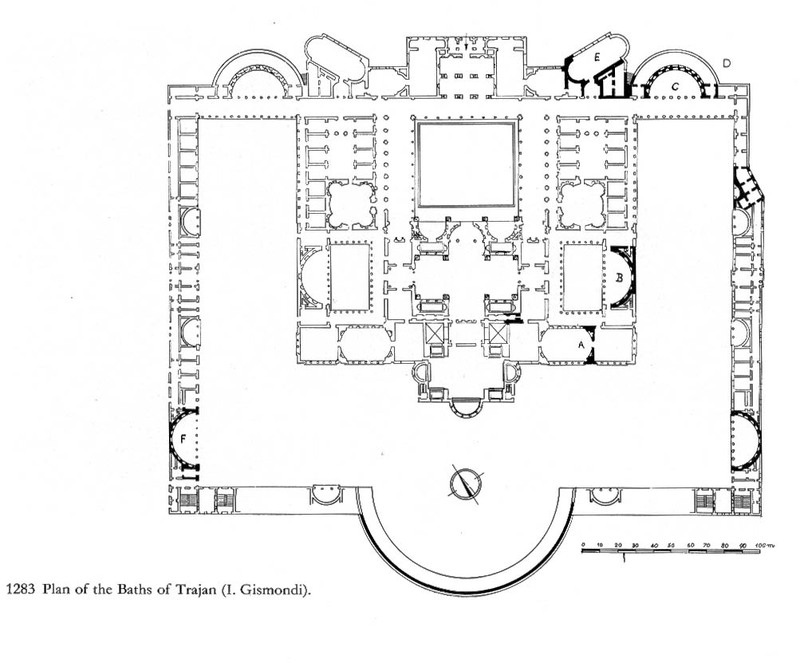 Because we from the plan of the Baths of Caracalla, this is a detail of just the bathing block, and if we compare the general plan with the plan of the Baths of Trajan in Rome, we will see that the Baths of Trajan, which were very large in their own day, have been exceeded here in terms of size, but are very much in the same general format. By that I mean a large bathing block here, inside a larger precinct. That precinct has around it a host of rooms that were used as lecture halls and seminar rooms and Greek and Latin libraries. So a great locus of intellectual, as well as wellness, in the city of Rome, in the third century A.D. In fact, you’ll be interested to hear that the span of the dome of the caldarium of the Baths of Caracalla was almost as large as the span of the dome of the Pantheon in Rome; just to give you a sense of the extraordinary bigger is better scale in this particular bath. Over here a natatio, located where it usually isn’t, but here on axis with the other rooms: an interesting natatio with a scalloped side, screened by columns. And then otherwise all the rooms symmetrically disposed around it. 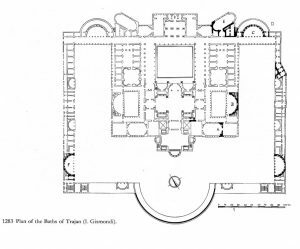 The two palaestrae, one on either side — matching rooms symmetrically disposed around the central building block. 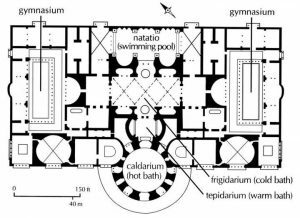 So the same imperial bath structure type, that we saw developed under Titus and Trajan, but taken to much larger scale here. This model (switching to ruins and back for an overlay) shows you the hall. 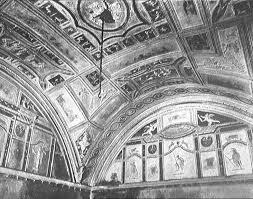 Wee see the walls, which were very plain on three sides, toward the natatio, toward the vaulting of the frigidarium. 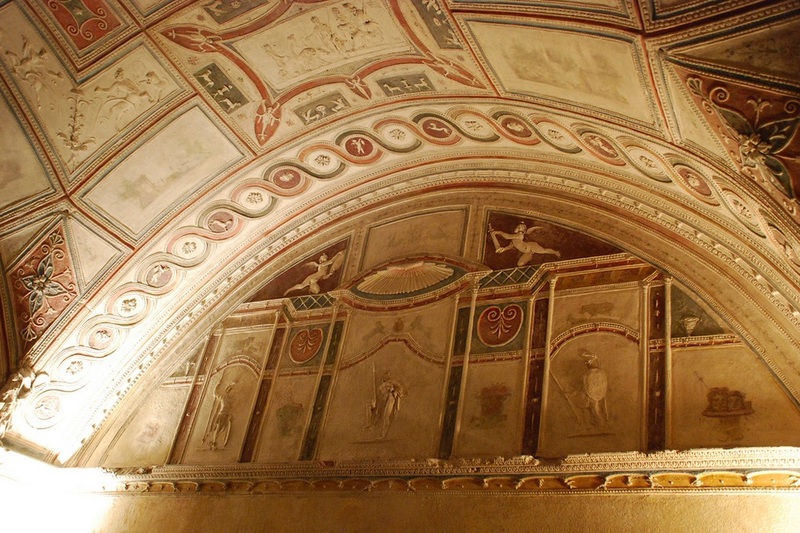 And then the dome, as you can see there, of the caldarium. Interesting is the front side of the–or the side where you can see the caldarium projecting over here, which you can see is opened up much more than the other sides, with a series of columns, screened columns, and then columns screening and opening up the caldarium as well, on the southern side of the monument. It’s mainly piles of concrete faced with brick. But you can see some of the soaring vaults still there. The ruins show it as much smaller than it would’ve been, because so much of the ceilings and the vaults are missing today. 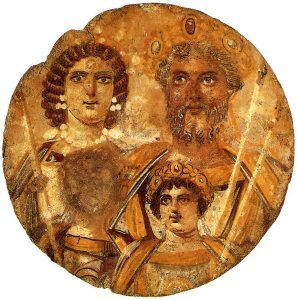 But you can get a sense by looking at this family of four, standing next to it, the colossal scale of the Baths of Caracalla in Rome. Here’s another view, with some tourists as well, to also give you a sense. Again, this is very incomplete today, but it still gives you some idea of the colossal magnitude of this particular bath structure. Mosaics, geometric mosaics, not unlike those in Ostia, found, and still exist, in the Baths of Caracalla today — black and white with a little addition of color. Here another section that shows you the interest in geometry, as well as floral motifs. 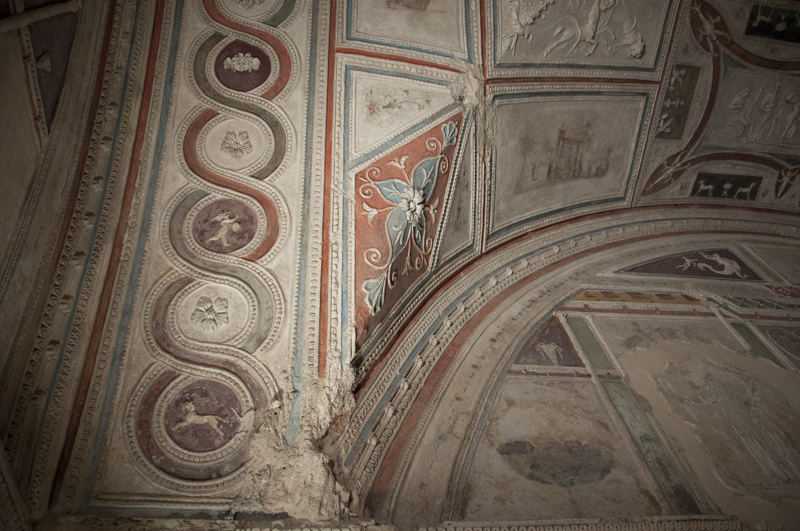 This detail, that you can also see on the site still today, showing the sea scenes that were not–were the kind of scenes one would expect in a bath, very similar to those at Ostia but done in a somewhat more–a better way. 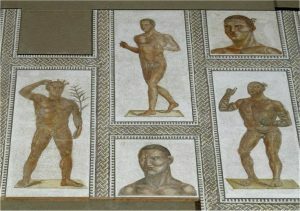 And then the pièce de résistance, I think, of the mosaics of the Baths of Caracalla, and well preserved today, was a mosaic that you can see is curved, to be placed into a room of this shape that depict on the floor all the famous athletes and gladiators of the day, either in full-length images or in portrait images. And I don’t doubt that these would have been recognizable stars, superstars, flexing their muscles for the public, and hoping to be recognized by everyone who came to this bath. And you can just imagine men and women standing above, looking and trying to pick out who is depicted here. 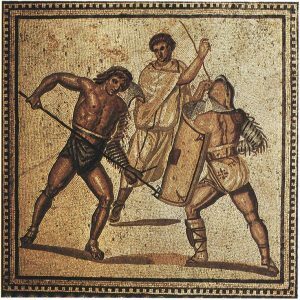 We can still see what survives mosaics with the athletes and gladiators of the day. And I show them to you here as well. And if you look at these, you can see that they not only are shown–some are already victors, some are taking part in their sport. 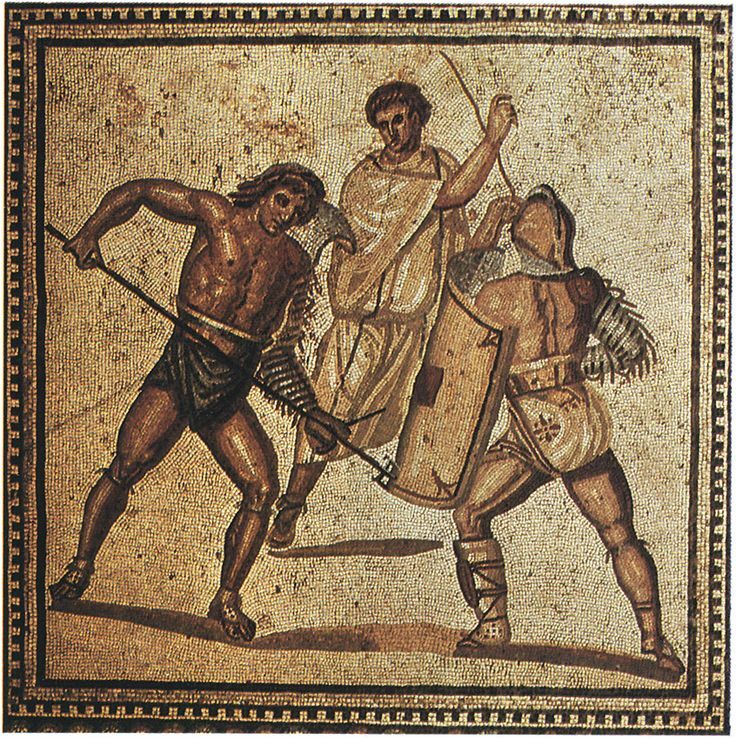 But once again, just as in the Alexander Mosaic, we see the use of a lot of different colored tesserae. We see cast shadows. 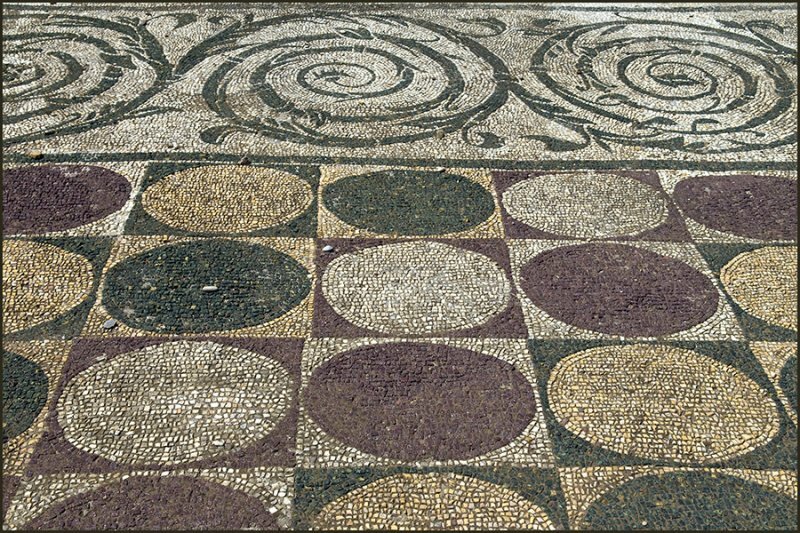 This is very well done: wonderful facial configurations done by what must have been the leading mosaicist of the day, for the Baths of Caracalla. And just in closing today, I thought I would show you one of those heads, blown up to poster size, as you can see here, but also put it next to an actual portrait of Caracalla. This is not a course in sculpture, but I wanted to show this to you, especially since it’s a portrait that you can see. It’s in New York, at the Metropolitan Museum of Art — a very powerful portrait of a very intense Roman emperor, as you can see on the left. 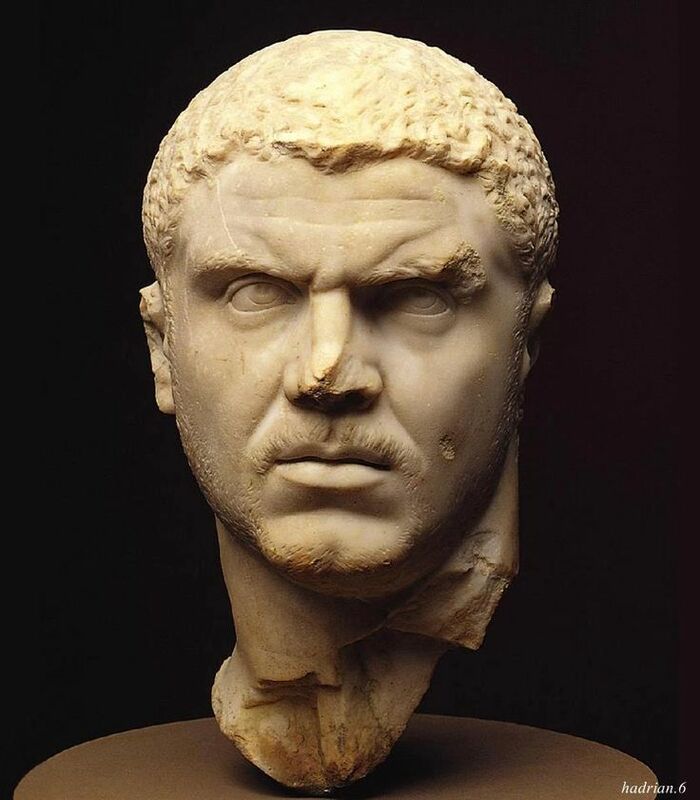 But I think there is some relationship between the way in which the sculptors have depicted Caracalla, with his very cubic and abstract face, his short military hairstyle, and the depictions of the athletes and the gladiators. So I think he was not only trying to draw a relationship between himself and Hercules Romanus, but also between himself and some of the greatest athletes and gladiators of the day, to underscore his strength as a leader. It was all for naught ultimately, but nonetheless he achieved it, and I think it also speaks to him as a man with that bigger is better philosophy.